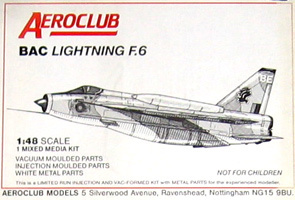 A brief rundown of some of the many model kits available of the Lightning. While there are a lot of models around, there are only a few that actually capture the precise look of the real thing. 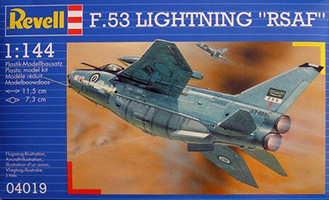 The only injection moulded plastic Lightning in this scale is from Revell (and also re-issued as the F.53 Lightning "RSAF" boxing with Saudi markings - beware, earlier issues of this one have the Saudi markings in far too light a shade of green). It is a real gem of a kit with finely done recessed detailing, good outline shape and fairly good decals. The intake ring shape is a little egg shaped rather than round. The undercarriage doors are too thick and do not fit well if you choose to model it "gear up". The missile pylons would be too far forward if you put them where Revell want - use photos to get it right. The cannon bulges in the belly tank are a little long too, but other than that there are no real criticisms of its accuracy. It does need some sanding and filling to get rid of a few sink marks and ill fitting parts but this isn't a major problem. Unfortunately the kit is long out of production and now fetches high prices on eBay. AirAlex do a resin conversion kit designed for this kit to enable you to build a two-seater - though the canopy looks to be poorly shpaed. Reasonably priced though, especially compared to the second hand value of the Revell kit! If it's 1/72 you're after you might as well stop reading this page now. 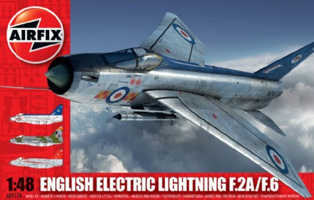 The new Airfix kits are hands down the best kit of the type that have ever been produced. Accurate, beautifully fine recessed detailing, excellent decals, and they go together very well (though do be careful of the fit of the cockpit tub and make sure mating surfaces throughout are free of any paint or flash - these really are precision engineered kits, but there is flash here and there that will ruin the fit if not dealt with). The first boxing is of the F.2A, and correctly depicts the short cable ducts and gun ports of this mark. Weapons wise, a pair of Firestreak missiles are supplied - all the real thing ever carried. Decal options are for XN781 of 19 Sqn, RAF Gutersloh, 1974 (dark green uppersurfaces) and XN793 of 92 Sqn, RAF Gutersloh, 1972 (overall natural metal with blue tail). The kit has also been released as a gift set with some glue, a naff paint brush and some naff little pots of acrylic paint. 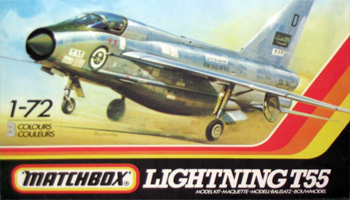 The decal sheet on this boxing is simplified, offering only one option (XN781) and far less stencils. In both boxings, the instrument panel decal is that of an F.6 cockpit (with strip-style airspeed indicator) - though frankly you'd be hard pressed to spot that at this scale. Also while an optional refuelling probe is supplied, the RAF Germany Lightnings never almost never used them. All the comments as regards the F.2A apply equally here. This boxing is a little more expensive, as there is an extra sprue in the box that includes a pair of Red Top missiles (and their different mounting shoes - nicely spotted Airfix... shame one of the missile fins was incompletely moulded in my box though), cable duct extensions, over-wing tanks, nose gun port blanks and belly tank forward half with gun ports - all the differences to enable you to model any F.6. The instrument panel decal is the same as the one in the F.2A kit, i.e. it is actually correct for the F.6! Decals are excellent again, offering options for XS927 of 74 Sqn, RAF Tengah, 1970 (natural metal, black tail) and XR728 of 11 Sqn/LTF, RAF Bimbrook 1988... and Bruntingthorpe present day (camouflage grey). At the time of writing this kit is available at discounted prices from many retailers online including various eBay sellers - well worth stocking up! 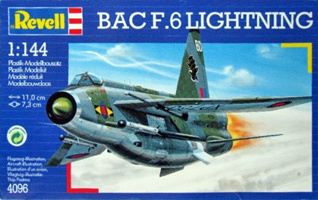 This used to be the number one choice if accuracy is your goal, as no kit in 1/72, prior to the new Airfix ones, got as many things right as this one does. Mostly resin, with white metal parts for the cockpit and undercarriage, the latter is the usual sort of white metal quality (i.e. much cleanup needed), the resin is nicely cast with just a few bubbles and holes in it. Unfortunately a number of parts are attached on their flat sides to a huge casting block, so removing them will be hard work indeed - particularly for the thinner items like the gear doors. A good set of decals are provided and the finished results I've seen from this kit have been very impressive. For the price, this blows the Trumpeter Lightnings out of the sky. The kit has quite a history behind it and is one of various resin Lightnings around that all appear to descend from the same master. 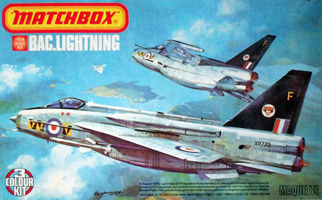 Since the release of the new Airfix kits this kit has gone out of production and is probably unlikely to return. This is a typical Matchbox kit, with very basic cockpit, mostly raised detail (for once), but overall a fairly accurate shape - certainly much better than the much more modern Trumpeter kit. Two versions of the kit exist, the single seater and twin seater, but the latter only represents the Saudi & Kuwaiti T.55 variant and cannot represent an RAF one due to the large belly tank and retaining the wings from the F.6/F.2A kit. 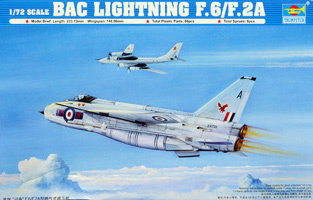 It is often used as a basis for converting the old Airfix 1/72 kit to a two-seater, however. The accuracy issues to worry about on this one are mostly minor, being restricted to a simplified kinking of the wing in the forward view and the generally basic nature of the detailing. Raised lines and panels abound to represent items that are actually just painted on the real thing - e.g. the belly tank stripes, dashed lines on the rear fuselage and refuelling points on the wings upper surfaces. Of more concern is the width of the fuselage - it's too narrow and many modellers insert a plastic card shim between the fuselage halves to broaden it. If you're prepared to put in a lot of work adding cockpit and undercarriage detail and sanding off and rescribing the panel line detail, this could make a better basis than the Trumpeter kit. The decal sheets for both boxings are very basic so a third party sheet would be a good idea too. There were high hopes for these kits where they were announced, and to be fair each one does offer some exquisitely done surface detail and goes together very nicely. However, Trumpeter's research has let them down badly and each kit has a number of major accuracy issues. Most noticeable is the rear fuselage, which is far too narrow and pinched-looking with feeble little jetpipes. The nose is a little short which appears to make the wings slightly too far forward (Trumpeter have made the intake ring too deep to compensate). The canopy looks to be too large and gives the nose a bit of a comical look as a result. The prominent APU exhaust on the port rear fuselage is too large and has no depth at all. The belly tank on the F.6/F.2A is much too large and has the wrong cross-section and overly large fins (the F.3 belly tank isn't quite so bad). The F.6/F.2A wing leading edge is also missing the triple kink that the real thing features (from overhead it is there, but on the real thing you'll also see kinks in the side/forward view as well). The spine shape is slightly off and is missing a prominent scoop intake. The tailplane shapes are a little off but easy to fix. Finally the undercarriage legs are too tall and the wheels are too big! A venerable old mould that has been boxed and reboxed ad nauseam. 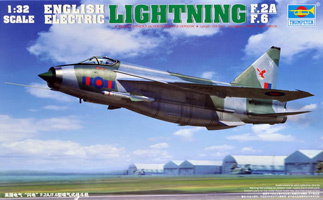 Original made by Frog, Hasegawa took the moulds on and reboxed it and more recently it has been sold by Revell. The plastic inside the boxes is basically the same (Hasegawa made some minor changes), and is far from the quality you would expect of either Hasegawa or Revell despite nice box art from both companies. In terms of accuracy the kit falls short, as seems to be the case with all 1/72 plastic offerings. The nose and canopy shape are off (though far less noticeably so than with the Airfix or Trumpeter kits). There is no cockpit or undercarriage detail to speak of. Detailing is by fine raised lines and is mostly OK. It is roughly on a par with the Matchbox kit in that it is a broadly decent representation but lacking in detail. 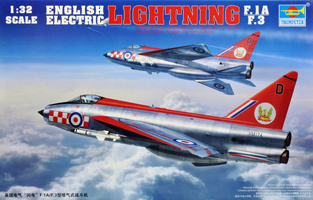 As well as the major reboxings by Hasegawa and Revell it has also appeared in boxes from other manufacturers such as Eastern Express. 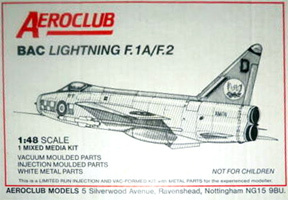 Revell were so guilty about re-issuing this old kit that they even included a disclaimer in the box asking you to excuse any shortcomings in quality! An absolutely ancient mould, originally issued as an F.1A and later 'upgraded' to an F.3 with a different tail fin. 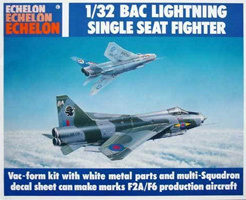 It has also been issue by MPC and by Airfix as a "snap fit" kit. This ia a very crude kit with numerous inaccuracies, the most egregious being the shape of the nose - and the fin on the F.3 boxing! Surface detail is pretty poorly done raised lines, and anything that could have possibly been detailed wasn't. About the only use this kit has for most people these days is in providing a set of 'straight' wings and small belly tank for converting the Matchbox T.55 into a T.4 or T.5. 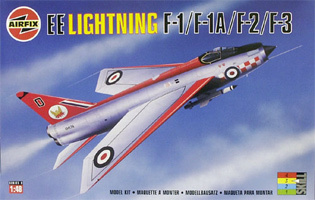 By far the best Lightning kits in any scale, bar none. 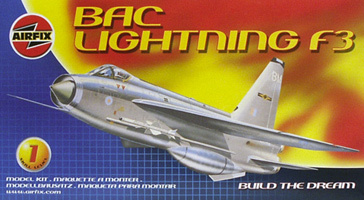 Airfix pulled a blinder when they released these monsters in the 1990s but they soon went out of production and in recent years have been fetching silly prices on eBay. 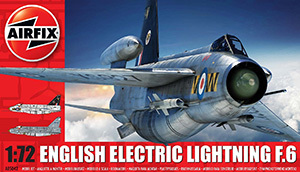 Happily for modellers, Airfix have re-released both kits though the price is now rather higher than it was when they originally came out! There is little to say about these beauties other than "get one" because the kits are just so good. Very finely done recessed detailing, a decent cockpit, accurate overall shape and great decals. The only criticisms that can be made are there are some obvious sink marks and many boxes contained kits with warped port wings - easy enough to straighten out with the application of some heat and patient bending. It remains to be seen whether the re-release has the same problem. Being a popular kit, there are a slew of third party add-ons such as more detailed cockpits and wheel wells, and also conversion sets to enable you to build a T.4 or T.5 from the kit that covers the earlier marks. These items are all of variable quality - some of the safer bets are from Aeroclub (sadly only available second hand now at crazy prices) or CMK. 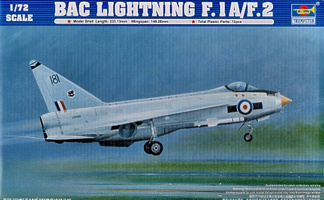 Before the Airfix 1/48 kit hit the shelves this mixed media (vacform, injection moulded and white metal) kit was the best option and still remains a decent kit. However with Aeroclub shutting up shop, it is only available on the second hand market and prices have been inflated for some time. The re-release of the Airfix kit may have an impact on that! This model is well engineered, goes together nicely (though of course is more challenging than a mainstream injection moulded kit) and I have seen some stunning results produced from it. 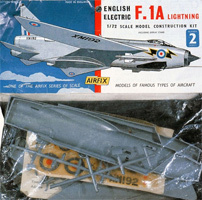 This is the only entirely accurately shaped Lightning kit in this scale - but it is long out of production and can only rarely be found second hand. As such it commands quite a premium over its original selling price - though some sellers are obviously greedy and and when you see people trying to sell them for over the £200 mark things are getting just a little silly. The kit is a nice package of vacform plastic for most of the airframe and white metal for various detail parts such as undercarriage, exhausts, cockpit parts and so on. There is a very good decal sheet covering several aircraft. 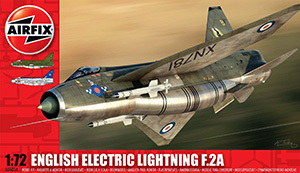 Unlike any other Lightning kit that claims to cover both F.2A and F.6, alternative belly tank fronts are provided for aircraft with or without belly guns that correctly reflect the changes in the tank's shape. Panel lines are recessed but very lightly, and apt to disappear if any sanding is done - most builders carefully deepen them with a scribing tool. While adequately detailed, the kit's size does mean it benefits from additional detailing; Flightpath produce a large and expensive etched metal detail set that also includes resin missiles. John Wolstenholme's inspirational build thread is here. Many of the comments on the Trumpeter 1/72 kits apply to the larger scale versions too (the 1/72 versions were released later, and are apparently just scaled down from the 1/32 originals). So, belly tank too big (but not long enough, and undercarriage legs are too long to keep the ground clearance correct! ), rear fuselage too pinched, wings in the wrong place, nose too short, canopy too bulbous and wide (because cockpit opening is too wide/sills too low), intake ring too deep... and the intake assembly doesn't meet the ring, leaving a nasty gap that is difficult to fill due to lack of access. Tailplanes are too large and the wrong shape; fin is also doubtful. Surprisingly, given the large scale, a number of detail items such as aerials and scoops are missing (including spine intake) or moulded massively overscale (the spine rod aerials are more like horns). So, lots of work if you want an accurate Lightning - you can of course build it out of the box and get a result that does look pretty much like a Lightning if you're not too familiar with the real thing. Not what you want from a kit that is approaching £100 though - and given the amount of plastic you get, even if it was accurate it'd be overpriced! A detailed thread on some of the corrections needed is here. A strictly limited edition and somewhat basic vacform. 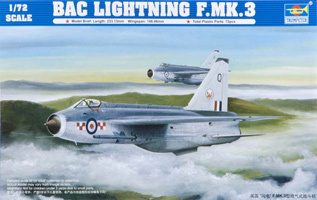 This kit was not meant to compete with the smaller 1/32 Echelon vacform for detail or accuracy but acts more as a basic blank canvas from which the really accomplished modeller can make a start on building a really big Lightning. Resin is used for more detailed parts - cockpit tub, wheels, undercarriage, wheel wells, radar bullet and intake ring. Most of these are fairly well done; the jetpipes are fairly basic and the undercarriage doors bear little relation to the real thing. The intake ring is a bit rough, and the nose gear bay pretty crude too. A large and excellent quality decal sheet provides markings for one aircraft (XR728 of the LTF) and lots of stencils. The vacform parts have the major panel lines engraved on them, though these are rather deeply done. The host of smaller panels etc. you will need to scribe yourself; you'll also need to add the host of intakes and vents that are scattered all over a Lightning's fuselage. The fin parts are not tall enough but a resin extension is provided to fix this. 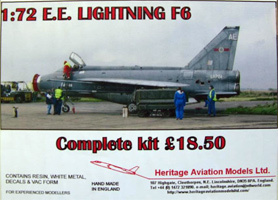 Overall then, not an easy kit to make and nowhere near the standards of Heritage's 1/72 resin example. However, it is the only game in town in this scale - if you can even get hold of one, as the limited production run sold out within months of release. In terms of accuracy, from what I have seen of built-up examples, it is pretty good with a couple of issues - firstly, it sits a little low to the ground, so extending the undercarriage legs is necessary. Secondly, the nose appears to be a little too slab-sided so could do with being more rounded. The wings look good, though getting the distinctive triple kink to show up correctly is really going to be down to the individual modeller given the nature of vacform parts.